He has jetted out to the highest ski resort in Europe, Val Thorens with his wife Michelle Keegan. And despite the chilly climes, Mark Wright couldn't resist stripping down to his boxers for a very cheeky Instagram snap to plug his new show, The Bachelor on Tuesday. 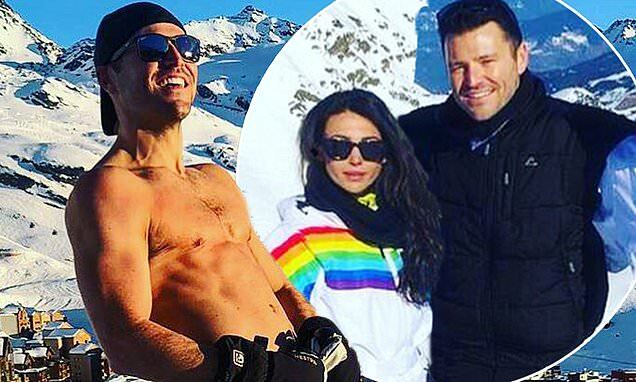 The former EXTRA presenter, 32, undoubtedly caught the eye of startled skiers going down the slopes as he flaunted his gym-honed frame in the teeny-tiny Y-fronts. In-keeping with the snowy backdrop, Mark tried to the look the part as he donned a pair of ski boots, skis and gloves. Gazing up to the sky, Mark beamed with confidence as he posed for the risqué snap. The couple are staying in Val Thorens, located in the Tarentaise Valley with a group of pals. It is the highest ski resort in Europe, at an altitude of 2300m. In his flurry of Instagram snaps, Mark also shared shots while heading down a mountain and posted an image of an Irish coffee he was enjoying for some apres-ski. Michelle was also indulging as she posted a shot of a creamy hot chocolate before the duo headed out for a pizza.